The UPOU Alumni Foundation, Inc. is a non-stock, non-profit organization constituted by the pioneering alumni of the University of the Philippines Open University. The Alumni Foundation is comprised of graduates from various undergraduate and graduate degree programs of UPOU. Its first organizational meeting was held at UPOU Headquarters in Los Baños, Laguna on 21 February 2001, wherein the first set of officials was elected. In February 2006, the UPOU Alumni Association formally became the UPOU Alumni Foundation, Inc. following its official registration in the Securities and Exchange Commission or SEC. During the Centennial celebration of the University of the Philippines, the UPOU published a coffeetable book titled, "100 Narratives" that featured the heartwarming experiences of various members of the UPOU community. Several alumni shared their stories in this collection of memoirs. To be the prime partner of UPOU in the realization of its programs. 4. Establish relevant programs and projects based on the Foundation's long and short term plans. To be the responsive and proactive arm of UPOU in promoting and sustaining its advocacy. Chat with us, be among our bloggers, join us on Facebook, or simply follow us on Twitter! There are so many ways to keep us in touch! You can even share photos, post announcements, or invite us to your upcoming events! The 15th Commencement Exercises of the University of the Philippines Open University is set on May 7, 2011. For our dear graduating batch and future alumni, let us introduce (or perhaps reintroduce) you to our unique graduation garb, the Sablay, which you will all wear with pride and honor on graduation day. Congratulations to all! The University of the Philippines, as the eternal vanguard of Philippine nationalism, poses an alternative to the Western toga and cap as the graduation attire of choice for Philippine schools. 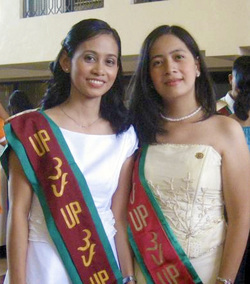 The sablay — first used at UP Diliman in 1990 — is a truly unique, truly UP, and truly Filipino academic adult costume. The word Sablay has two meanings: one, a loose piece of clothing, worn by a person, that is simple yet elegant and joined in front by an ornament, and two, the draping object or fabric on the shoulder. The Sablay gets its inspiration from the muslim malong but incorporates various traditional elements found in other Philippine cultures. 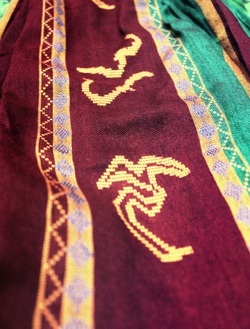 Running through the Sablay are geometric motifs of indigenous Philippine tribes. The characters woven into or printed on the sablay are in Alibata, the ancient Philippine alphabet, and stand for the initials of UP. Upon graduation, the sablay is transferred from the right to the left shoulder — the consummation of a UP student’s college life. (Source: Crimson Crux, 2006).